1994 - 1999 Toyota Celica information. The Series 6 Toyota Celica, from 1994 - 1999 is often preferred over the last, Series 7 1999-2005 model. It has a "retro" look about the headlamps but a very slick, modern shape. Now for something useful. If you own a 1994-1999 Celica, and have done around 60,000 miles or more, you may have noticed a clunk / clonk noise from the back or underside of the car. This can happen when going over bumps or when braking lightly. The cause is wonderfully simple and cheap to solve. 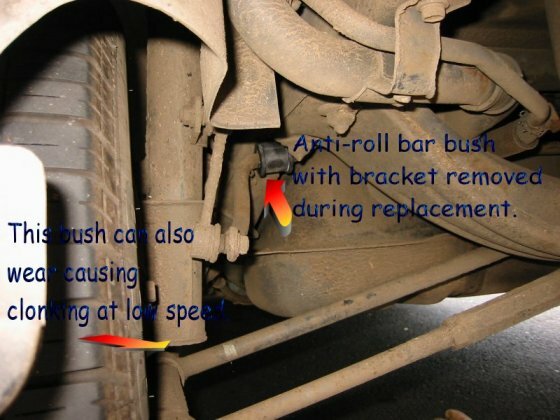 There are two Anti Roll Bar Bushes, and even slight wear in these will cause noises. 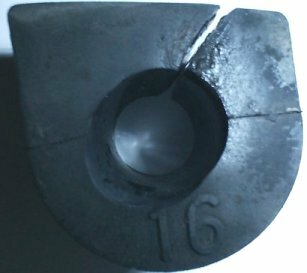 The split is supposed to be there, but the wear in the centre bore is not. These cost about a fiver each at your Toyota dealership, and any mechanic can fit them both in just a few moments, so don't pay too much to have them fitted. My mechanic said "It took longer to jack the car up than to fit them". The part number is T488818-20380 (Stabilizer bush N/STK), and you will require two of them. Don't fit one and have to go fit the other a few months later like I did! 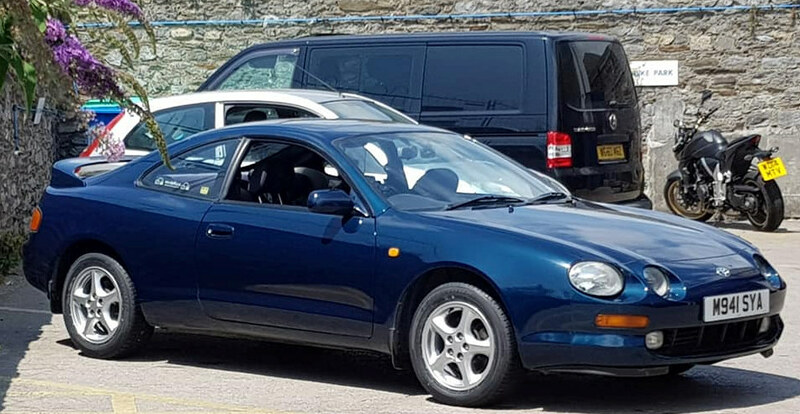 I've been told by two readers that the same problem applies to the earlier series of Celica which ran up until 1994, but I don't have the part numbers for the earlier models. If clonks are only at low speed when going over bumps, you may have worn out a rear wheel control arm. There are four of these, two with adjusters to set the rear wheel alignment. In my case, after a lot of driving through poor quality country roads, the bush developed slack in the nearside non-adjustable control arm. The whole arm had to be replaced at a cost of some £80, part number T48710-20320. Since we are talking about possible faults as these cars get older, I know I'm not the only one to have had this gearbox fault: After being (Toyota dealership) serviced with a gearbox oil change, I found the gearbox was horrible to use when cold, it would crash into 2nd and 3rd gears until warmed up. Even when warm it was notchy. A good mechanic (not Toyota dealer) repaired this by replacement of 2nd and 3rd Synchro rings and some needle bearings. While there, since the car had done over 60,000 miles at that point, a new clutch was fitted. Unfortunately this had a chance effect of fracturing a cable to the front left wheel ABS sensor so this had to be replaced too. The bill was a depressing £900. Some years later, the car has behaved itself impeccably, so I've forgiven it for this failing. Many years later, and on my wedding day, the car did break down for the first time ever! 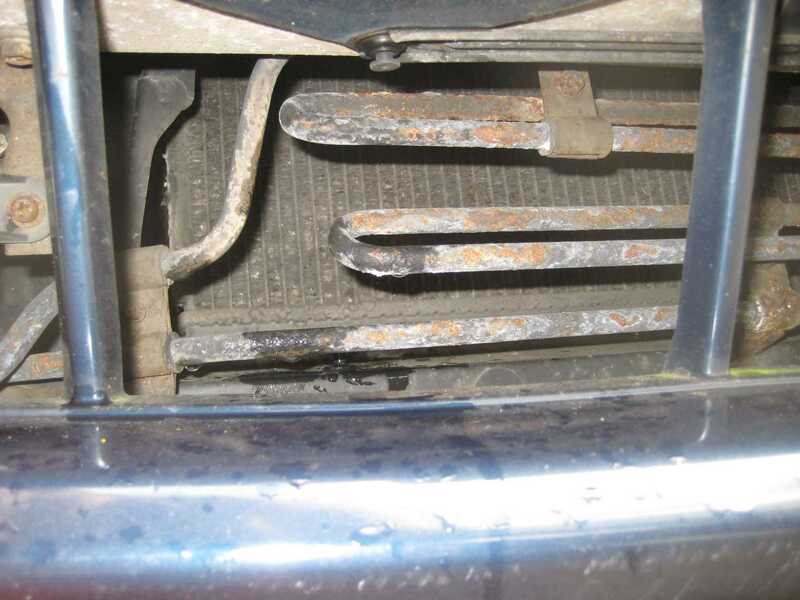 The clutch pedal went to the floor but the car remained in gear. Had I thought about it, I could have pulled the pedal up by force and it would have worked, but the fault comes back. Replacement master and slave cylinder seals plus fluid solved the problem permanently. If the electric aerial jams, it doesn't always have to be replaced. If you're lucky you can fix it like this: Switch the radio on and leave it on. Undo the top nut holding the aerial to the wing. Pull the broken mast up and away from the aerial body. Fit a new mast, available from a Toyota dealer for around £25 by inserting the toothed nylon rack into the aerial body, with the teeth facing towards the circular plastic housing side. Switch the radio off and the aerial should retract, refit top nut. If like me you are less lucky, the nylon flexible rack will have snapped off inside the body. Take the interior panel off inside the boot, and remove the aerial from inside (held on my just one bolt), after pulling the old mast off as best you can. You will need to take the aerial apart and get quite mucky to extract the broken rack segment before fitting the new mast. I have access to a 12V current limited power supply in my workshop which I used to drive the motor manually and test that I had it correctly reassembled before refitting to the car. If you don't have this, take it back to the boot of the car and test it there with the car's connector before fully refitting. This job took me about an hour and saved me having to buy a £200 replacement aerial, so was well worth the trouble. Years later the aerial became noisy but still worked most of the time. One day it stopped half way and hardly moved from there. What had happened to cause the initial noise was that one of the magnets had come adrift inside the motor, but it was still sufficiently in place for the motor to run. Then about a year later the second magnet came adrift and jammed the motor. It's actually possible to dismantle the motor and superglue the magnets back in place, but most people would try to get hold of a second-hand aerial unit. There were two types of immobiliser / alarm fitted to UK cars. For the later type, with the "blob" shaped remote controls, here is what to do if you find you cannot unlock the car: "Remove back off the key fob (remove battery power) THEN... Press the buttons simultaneously!!! (all well away from vehicle). Replace back of fob. Now aimed at the car press the unlock button TWICE - side blinkers should now flash and central locking unlock!!!" This would appear to be resetting the rolling codes back to the start point and the alarm must be built to always accept the very first code if sent twice. First use the "castle key" to switch the alarm sounder off, if you don't have this then the following will be a noisy experience! Disconnect and reconnect the car battery. Open a door, and the indicators should flash showing that the alarm is activated. If this does not happen, reconnect the battery, disconnect, open the door again, and repeat sequence until such time as the indicators do flash. Now press the keyfob button to switch off the alarm. No response? Press and hold the button for several seconds, then press once more. No response still? Then disconnect the battery for a few seconds, reconnect, and go through the keyfob button pressing sequence again. You may need to do this repeatedly, perhaps 100 times or so if you're unlucky. Eventually you should hear the central locking operate when you press the button. Don't disconnect the battery again! Attach the battery terminal securely, remove the castle key, and give thanks that it's all working properly again. If the above doesn't work then you are STUFFED! The T5000 alarms do sometimes completely trash their internal codes and since the manufacturer can't reprogram them any more, the only solution is to bypass the system and/or install a new immobiliser. It's best to speak to the manufacturer for information on bypassing the alarm, however I can tell you that it involves: Locate alarm, mounted on a bracket above the glove box which is fairly easy to remove. Unplug alarm control unit. Insert a link across two contacts of the alarm connector, Scorpion alarms can tell you which, they allow the ignition key switch to operate. Then locate the immobilser, mounted right next to the alarm control unit, this one stays in. There are four black wires leaving this going to the car's wiring loom; a pair of wires heads off towards the fuse box and another pair of wires probably to some trunking under the carpet in front of the passenger footwell. Exactly how these are wired in will probably vary from one car to another as they were installed by the dealers when the cars came into the UK. Each pair of black wires "interrupts" a vital connection which will prevent the car from starting, so you need to re-connect each pair of black wires (don't mix them up of course, but as the wires run to different places, they are reasonably obvious). One loop prevents the car from starting, the other loop is operates fuel pump. You could chase the wires right to their ends and remove the black wiring completely. Once that is done, the car will run again, though with no remote control central locking and no alarm or immobiliser. But since the job saves the car from the crusher and takes about 45 minutes, it's well worth doing! Next you might want to install a new alarm system, such as the Scorpion SA30 or better the Toad Ai606 which are made by the original alarm manufacturer and has broadly the same functionality. I installed the Toad Ai606 in mine, which gives very similar functionality to the original system, it took me about 4 hours to do properly. Then I added an aftermarket door motor and relay to the boot release mechanism, concealed nicely in the black plastic panel at the very back of the car inside the boot, and wired this to the Toad system. Hence I now have remote control boot release on my 1994 Celica, a nice modern touch and probably very few Celicas have that feature. There are two sets of batteries in the T5000 systems: Five AA Ni-Cd batteries in the sounder, which are fairly easy to replace. A set of cells in the immobiliser unit which sits next to the alarm control unit, mounted above the glove box. These are the ones which cause all the problems if the car battery goes flat, but they are not practical to replace. I have a spare T5000 sounder with new batteries installed, which I can sell if you require that. One T5000 keyfob failed on me, the LED did not light and the car did not respond. The cause was a fractured leg on the LED itself. The current for the keyfob electronics flows through the LED first, it is in series. I fitted a white 3mm LED to replace it, which works very well and looks smart. Don't do the following on a very icy cold day: Start the car, lock the doors from the inside, and then decide to get out to scrape some more ice off the car. If you do this, there is a risk that the driver's door will close behind you AND LOCK SHUT. What can happen is the ice prevents the door from unlocking properly when you get out. Now you are left standing outside the locked car, engine running, keys inside. Believe me, you feel like a fool. The solution is to poke a stiff wire into the car past a front window (they are frameless), and actuate a window winder or door lock switch. I'm yet to find any owner of this type of Celica, who can honestly say the steering is perfectly central. It's only fractionally off-centre, almost unnoticeable unless of course you are the sort of exacting person who drives a Celica! However, apart from being slightly irritating, it does no harm to tyres nor car handling. Fortunately, the car does not suffer at all from torque-steer. This is the effect seen in many front-wheel drive cars, and was almost unimaginably bad on the mid-1980's Vauxhall Cavaliers, whereby the steering pulls to one side under acceleration. 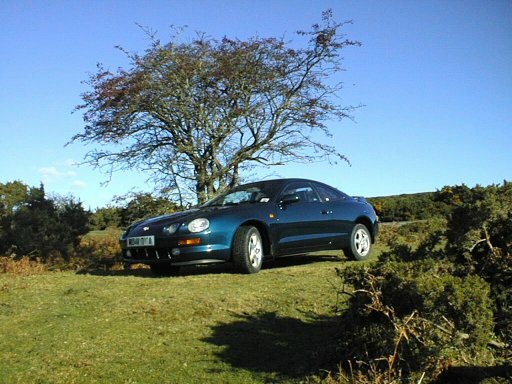 With 172bhp available, it's just as well the Celica has been carefully designed to completely avoid this phenomenon. The standard alloy roadwheels for the UK spec Celica GT are 205 55/R15 V-rated. I used to recommend the Goodyear Eagle Ventura as ideal tyres for demanding driving including poor roads which suffer from flooding. However the Good Eagle Ventura range has been discontinued, and stocks are probably exhausted. The replacement Goodyear Eagle Hydragrip is not made in the size for the Celica as of 2006. I'm told this size is not popular any more and may not be manufactured in modern tyre designs. The Goodyear Eagle NTC5 though available, is a poor relation for wet weather handling, and is better suited to shopping trips. Fortunately Toyo tyres do high quality wet weather tyres in the correct size for the Celica. The tyre pressures indicated inside the driver's door post, seem very high. You might be tempted to set them a little lower, or your tyresmiths may just set them on the low side. The result will probably be kackered tyre treads on the edges. This can even look like the tyres have been damaged by mistracking. There is a steering fluid cooling pipe which sits between the front bumper and the radiator. It can be seen easily by looking inside the grille beside the driver's side fog lamp. This is prone to corroding badly. A new pipe assembly comes with various fittings and mounts, and costs around £200. I was able to obtain a very good used one fortunately. This item should fail the MOT when corroded, but it's an unusual component so MOT testers can miss it. So take a look for yourself. For many years I thought the headlamp washer jets had failed on my car, because nothing happened when the car was parked up and I pressed the button. Only when driving along one evening did I test it once more, and they worked fine. The problem? The headlamp washer pump is only active when the headlights are on. Sensible I suppose. For parts you can try: Toyota Celica Breakers 01579 383879, Moss-Side Motor Bodyworks, Florence Road. Kelly Bray, Callington, Cornwall. 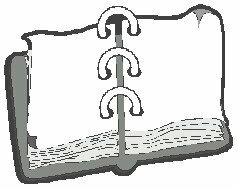 PL17 8EG, You can email them but if you phone them up, you'll find them very knowledgeable. As well as used parts, they stock a very wide range of original Toyota parts at good discount prices for Celica, Supra and MR2 cars as well as other Toyotas. City Auto Salvage in Sheffield also stock used Celica parts. Of course Toyota dealerships still stock all important components for these cars, and consumables such as brakes and clutches are not overpriced. Also see the Toyota Celica Club in the UK. I like to receive friendly email from nice people! Extensive spam filters apply. Other pages of mine: My Homepage , Pictures of Plymouth , Beta video format in the UK, a BSB & Squarial page, Hillman Avengers, and a Virtual Loft full of electronic stuff. Got a drain problem in Devon / Cornwall, see my friends at Able Drainage. Want to buy a good used car, see my excellent mechanic who keeps my Celica in top shape for me. The most affordable and flexible video tape transfer service in the UK. A personal service by an engineer with years of video experience.